When Nintendo’s DS system first made itself known, some of the best news for American gamers was the localization of the previously-unreleased remakes of the fourth through sixth entries of the Dragon Quest franchise following the success of the eighty entry, Journey of the Cursed King on the PlayStation 2, the series’ resurgence outside Japan partially due to the merger of Square and Enix. 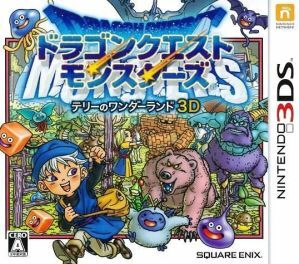 Lamentably for non-Japanese Dragon Quest fans, sales would suffer due in part to lack of advertising for various games in the franchise, and when the 3DS came around, many spinoff games in the pantheon such as the remake of the original Dragon Quest Monsters, entitled Dragon Quest Monsters: Terry’s Wonderland 3D, would remain untranslated, a shame given its polish. Terry’s Wonderland 3D is story-wise a prequel to the sixth Dragon Quest title, focusing on sibling characters Terry and Milly, who are disturbed by mysterious happenings in the middle of one night, with the latter kidnapped and the former following her into the Great Tree Kingdom on a rescue excursion. However, Terry’s quest to find his sister never seems terribly urgent, with some rehashing of events from mainline Dragon Quests at the end of most dungeons, although there are a few late-game twists and post-game addition to the main narrative. Despite its quirks such as occasional humor, the plot doesn’t really take on a meaningful life, but is hardly a distraction from the experience. That leaves the gameplay to shoulder the burden, and fortunately, Terry’s Wonderland 3D does pretty well in this regard, even slightly better than mainline Dragon Quest titles. The Dragon Quest Monsters subseries focuses on monster collection and training, and while some may condemn the remake to be a Pokémon clone, the Dragon Quest franchise actually contained the feature years before the Big N’s monster-collector franchise, albeit after the unlocalized Megami Tensei titles. The game is by no means a MegaTen clone, either, given its twists on the RPG subgenre formula. One improvement over the original Dragon Quest Monsters on the GameBoy Color is that the player now has four slots for monsters to fight on the frontline instead of three, in addition to four backup slots for spare monsters that fortunately don’t squander the player’s turn when switching formations. However, larger monsters can take two or three slots in either lineup, although such monsters typically have quirks that compensate for the usage of space, such as one or two extra random commands during a turn of battle, or normal attacks affecting all antagonists. The recruitment system comes from the Joker subseries, where the player can have all their active monsters strike an enemy to increase a gauge by a certain percentage that ultimately decides the chance of recruiting the monster. If unsuccessful, the player loses their turn and all enemies attack, although in these cases, the player can reattempt to scout a monster; types of meat can increase the percentage by a certain amount. However, if a player is unsuccessful too many times, all the enemies get a round of tension and attack, with no more recruitment ability available for the rest of the battle. If successful, however, the player can send the recruited monster instantly to the Monster Farm or place them in their frontline or backup parties immediately. Winning a battle normally nets all participant monsters, frontline and backline, experience for occasional level-ups, which may come with the acquisition of skill points the player can invest into various skill sets to learn new abilities, innate and MP-consuming, similar to the systems present in the eighth and ninth mainline Dragon Quests. Players also acquire money for the purchase of consumable items and weapons monsters can equip. When the player’s monsters reach level ten, the player can breed male and female incarnations of them, both retiring both used monsters and creating a new one in their stead, with the player able to see which new monsters they can reproduce. During breeding, the player can select skill sets for the new monster to inherit, either three or four depending upon the monsters. Monsters produced this way start at level one, although it’s not terribly difficult to level them up to ten to procreate some more, the game indicating reproductions producing new monsters, which is advantageous since uncovering certain numbers of monsters can open high-level grinding spots to make leveling easier. Advancing the story is a matter of progressing through randomly-generated dungeons with a certain number of floors and beating their bosses, with the player able to acquire a skill that instantly allows them to visit their penultimate floors. Unlocking new dungeons, furthermore, necessitates that the player participates in tournaments where the player can only issue general AI commands for their monster party and not issue specific commands or use items like in normal battles (in which case item use gets first priority regardless of turn order). The gameplay systems work very well for the most part, with the priority of item use and general consistency of player and enemy turn order being advantageous, alongside the general quick pace of combat, not to mention fun and ease of grinding and breeding monsters. Since issuing specific commands repeatedly, however, can be tedious, the player will likely want to stick to AI commands in normal battles, with the artificial intelligence being with a few exceptions competent, and in the end, combat is very much a boon to the remake. Dragon Quest titles tend to have issues with their control schemes, although Terry’s Wonderland actually does better in this area than mainline titles, with the ability, for once, to save progress most anywhere, not to mention the lack of repeated dialogues when shopping for new items, and ability to teleport among specific facilities in the Great Tree Kingdom. The monster breeding interface is very user-friendly, as well, players can see how new weapons increase or decrease a monster’s attack power, and aside from some minor quibbles such as needing a monster in the player’s frontline or backline party to manage them, the remake is incredibly user-friendly. Series composer Koichi Sugiyama, as always, does a wonderful job with the soundtrack, with standout tracks such as “Terry’s World,” and some dabbling into other musical genres such as rock in the case of the Starry Shrine theme. There are some recycled tracks from previous Dragon Quest titles, however, alongside some points with only ambient noise, but otherwise, the game is pleasant to the ears. Terry’s Wonderland 3D is pleasant to the eyes, as well, with well-proportioned character and enemy models fleshing out designer Akira Toriyama’s art style, in spite of some occasional palette swaps, not to mention some environmental blurriness with regards to texturing. Finally, finishing the main quest will run players one to two days’ worth of playtime, with plenty of postgame content enhancing lasting appeal. Overall, Dragon Quest Monsters: Terry’s Wonderland 3D is for the most part an ideal remake that North American gamers unfortunately missed out on, given its highlights such as superb gameplay systems, excellent control, nice audio, good graphics, and plentiful replayability. It only suffers with regards to its weak narrative and some recycling from mainline Dragon Quests but is otherwise perhaps one of the high points of the monster-collector subgenre of roleplaying games, and one of the best spinoffs in the series. Fans longing to play the game in English will be happy to know that a complete translation exists for the game. +Solid monster-capturing and battling mechanics. -Some recycled tracks from previous Dragon Quests. A great remake Americans definitely deserved.